"Everybody likes to joke about chicken—the rubber-chicken prize, or 'This alligator tastes like chicken.' It's calling something boring," says Judy Rodgers, chef-owner of San Francisco's beloved Zuni Café. But chicken done expertly, Rodgers says, "is like a perfect piece of toast with just the right amount of butter. It can be astonishing." She should know: Zuni's roast chicken is considered the best in the country—in a recent poll by foodandwine.com, Rodgers's recipe won by a landslide. 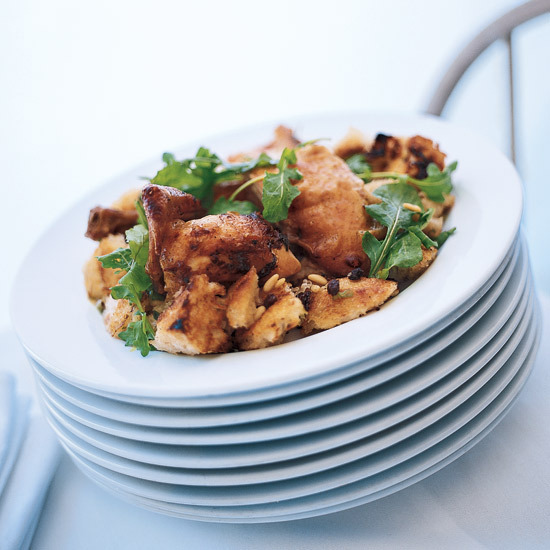 Rodgers joined Zuni in 1987 and, within months, proposed what the menu still calls "Chicken for two roasted in the brick oven; warm bread salad with scallions, garlic, dandelion greens, dried currants and pine nuts. (Approximately one hour.)" The dish depends famously on three key elements: small birds, high heat (450 to 500 degrees) and thorough presalting of the chicken several days before cooking. The essence of the Zuni chicken experience, in Rodgers's view, is that "it's like, 'Here. Is. Chicken.' " Pure and bold and underlined. "Then of course there's the family-style thing," she says of the way the dish is presented on a platter. "Eating with your hands, shopping around for the pieces you want. 'Oh, I want a gooey piece! Now I want a crispy piece! Get your hands off the pine nuts!' Plus, it smells good."